Twitter’s earnings report caused its stock to fall from $34.16 to $29.95 in 2 days which is a combined loss of 12.3%. It’s an interesting reaction because the firm beat earnings and revenue estimates. EPS was 31 cents which beat estimates for 25 cents. GAAP operating income was $207 million which was up 88% year over year. Operating margins were 23% which was up from 15% last year and 12% last quarter. GAAP net income was $255 million which was up 180% year over year. This quarter had a $120 million boost from realized deferred tax assets. Revenue was $909 million which beat estimates for $868.1 million. Revenues were up 24% year over year. Data licensing was up 35% and advertising was up 23%. 44% of business is international. For years the company couldn’t make a profit. Finally, it cut costs turning a profit even while it has had sluggish user growth and has had to fend off abuse on its platform. We’ve seen Facebook’s headcount explode and its margins fall because it needs to manage its community better. 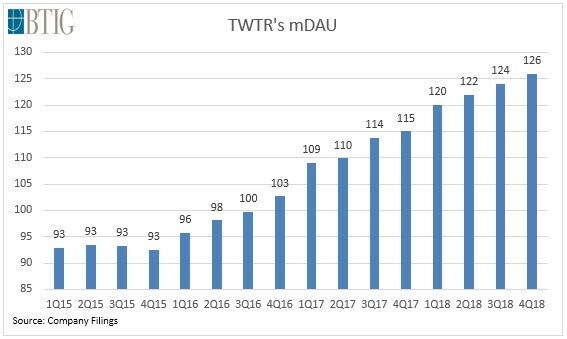 I think it’s an amazing feat that Twitter has become consistently profitable during this period. The fact that it is profitable limits the downside in the stock. There’s a very slim chance that it will revisit the share price in the mid-teens that it had in 2017. I think it’s completely wrong that the stock is down because the firm is finally taking steps in the right direction to prioritize engagement. 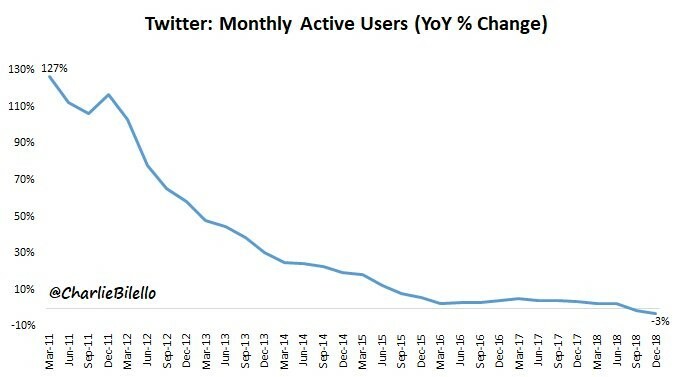 For years Twitter tried to catch up to Facebook’s user total by allowing abuse on the platform and counting monthly active users instead of daily active users. When the company decided to make profitability a goal, it realized engagement was more important than boosting monthly user totals. It’s weird to say this, but the firm seems to have finally started caring about its users. I will use an analogy with Netflix as a quick way to describe how Twitter was acting. It would be like if Netflix only cared about boosting subscription totals even if many of the subscribers were using the service on a free trial. While Netflix doesn’t seem to hate the idea of multiple people sharing passwords for one account, it took free subscribers out of its totals. Monthly active Twitter users don’t matter and free Netflix trial subscribers don’t matter. TWTR stock fell because of weak revenue guidance and because monthly active users fell even though that was expected. Specifically, Q1 2019 revenue guidance was for between $715 million to $775 million. The middle of that is $745 million. Analysts were expecting revenues of $764.9 million. Twitter needs to keep the influencers in its platform more than any other company. These verified users generate news and engagement. It’s better to delete a few abusive accounts than to have a major account leave. I say it's is more reliant on influencers than other platforms because the service isn’t used to connect with friends. It’s used to follow news and have conversations around topics in the news rather than to discuss personal matters. Skeptics of TWTR will claim the firm is switching from counting monthly active users because the numbers look bad. The firm had 321 million monthly active users which met estimates, but fell 3% year over year as you can see from the chart below. It peaked at 336 million monthly active users in Q1 2018, with 267 million being international and 69 million being from America. Now there are 255 million international users and 66 million domestic users. American users are easier to monetize. So Twitter’s international presence is a problem for the company, but that’s not news. Skeptics are completely wrong in this case. They would be correct if Twitter was shifting to a metric that’s less transparent, but it is shifting to a metric that is more transparent. I always thought monthly active users were worthless. Twitter will stop reporting them. Now that it's focused on its community, the firm can review what’s important, daily active users. One of the reasons TWTR stock fell is because some traders were shocked at how small Twitter is in relation to Facebook and Snapchat. As you can see from the chart below, Snapchat has 186 million daily active users and Facebook has 1.52 billion daily active users. Twitter defended itself versus Snapchat by saying Snapchat counts users who message each other which isn’t a monetizable function. That’s a terrible argument because we don’t know how many users do that and Snapchat could monetize that function. The better defense is the app is growing its daily active users while Snapchat isn’t. The fluffiest, but accurate defense is the TWTR app is more important than Snapchat. It also can’t be easily copied. Twitter is where journalists, politicians, and influencers break important news. While Snapchat is mainly used by teens to share their day. Facebook has successfully copied Snapchat’s stories feature, while it can’t copy Twitter as the best place to get the news. Facebook has experimented with a trending tab, but it will never replace Twitter. If you use Twitter, for the news it’s easy to see this. If you don’t, you can just look at its growing daily active users even with Facebook having a decade to try to copy it. Facebook copied Snapchat and slowed its user growth in just a few years.